🌟 I feel my reviews are becoming a bit clichéd because I keep talking about expectations. 🌟 But really I have found that expectations really affect how we review and rate books. 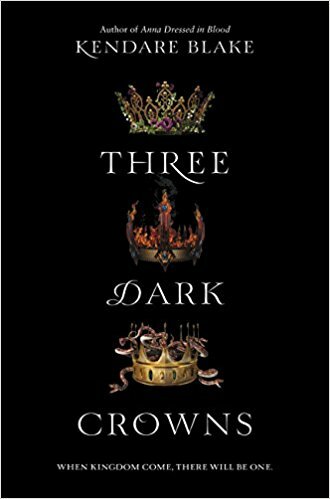 Three Dark Crowns biggest problem was its synopsis, it has an excellent synopsis, the synopsis itself is worth a 5 stars but the book is not. I know it is not bad to have a good blurb but is bad when it is misleading. 🌟 I have seen many bad ratings of this book so I decided to go into it without reading the reviews and to judge by myself. Most of the book my rating was 2.5/5 stars (50%) until the last pages were it jumped to 3 stars. 🌟 I can relate to both positive and negative reviews. I mean the synopsis implies that it will be action packed, I thought that it will be like the hunger games, they will be in a forest and they will start fighting from the start. But it was slower than that, but at the same time it was not a slow-paced books. I felt that the pacing was quite good. 🌟 It focused more on the politics -which I liked- and the romance -which I didn’t like- and what I thought the book will be is probably going to be the 2nd or 3rd book. 🌟 The writing was good, not special but good. I mean it is not magical or whimsical as other authors but was easy to follow and there were no confusions! 🌟 The characters were acceptable but sometimes they sounded the same and they can definitely use some more depth. There was some unnecessary fast romance that helped move the plot forward but it also could have been better once again. 🌟 Summary: This is a book with average characters, plot and writing. I have been reading way denser books so I didn’t feel it was slow but it may be slower than your expectations. The ending was not expect-able for me and it saved the book. I feel that the series will get better and that’s what I heard. If I have an advice to those who haven’t read this yet, just lower your expectations and don’t focus on the synopsis. 🌟 Did you read this book? Did you have high expectations and was the synopsis misleading? Who is your favorite queen? Great review! I want to read this eventually, so I’ll take your advice and go in with lowered expectations and without reading the synopsis. I don’t know. I think it was good but not wow, I am also not into dystopian genre anymore. I didn’t expect it too which impressed me given that I am excellent at predicting plot twists! Great review. I DNF’d this book after the first chapter. Honestly…it didn’t keep my interest.